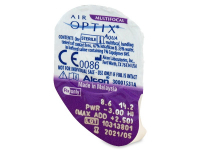 Air Optix Aqua Multifocal are monthly lenses to treat presbyopia. Their Precision Transition design allows for clear vision at all distances, and their AQUA Moisture System keeps the lenses hydrated and comfortable while wearing. Air Optix Aqua Multifocal contact lenses developed by Alcon provide comfortable and healthy wear for patients with presbyopia. 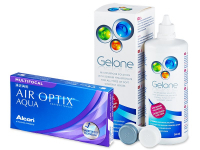 Air Optix Aqua Multifocal are monthly contact lenses designed for daily wear. Thanks to their Precision Transition Design technology, they provide clear vision at all distances. This package contains six lenses. 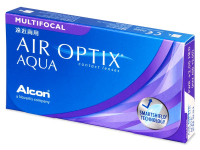 Read more about Air Optix Aqua Multifocal. I'm not a regular user of contact lenses but when I don't want to wear my glasses I always use these. They're easy to put and feel good when they are in. Of the multi-focal lenses I've used, these are certainly the best. You notice the difference in quality immediately. Will be buying them again. 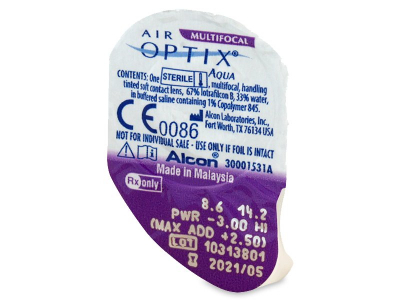 I am confused about Air optix multifocal add powers. If I have a dominant/non dominant eye, does this matter? thx. I'm wearing Air Optix Aqua multifocal with high add, and I'm very pleased with the comfort and quality. Haven't been as successful with other multifocals, but these are great for me. Will be back as a return customer, cheers. Great lenses, and super fast + reliable service. I've made several orders with you, and all have come quickly and hassle free. I am a big fan of the air optix line of products. Was wearing the night&day until diagnosed with presbyopia, but these are every bit as good. quite a relief! Quick and reliable service. My lenses arrived on the stated date. Will order again next time. Are these lenses extended wear as opposed to having to remove daily? Hi, Natalie, Thank you for your recent comment! You should remove them daily, but they are good for 30 days. Please feel free to contact us should you have any further questions!